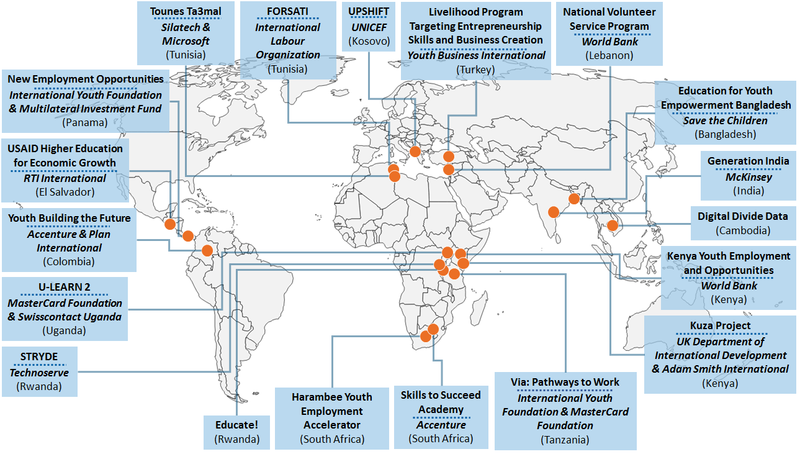 With sites ranging from Colombia to Cambodia and Turkey to Tanzania, the S4YE Impact Portfolio (IP) is a group of 19 diverse and high-potential youth employment projects that represent fifteen developing countries from six continents. These projects were selected through a blind-process by independent reviewers. Click the dots below to zoom to each site, and click the location for more information about the organization. To provide youth employment practitioners with insights into important aspects of the operations, design, and innovations of the 19 projects in the IP.